What is missed by Space Ape in this weekend’s bundles is the “deal” part of it all. There is no 25% bonus on the number of crystals in a package or on Cyber Coin purchases, and unlike other games there are no other gifts or other incentives to buy. 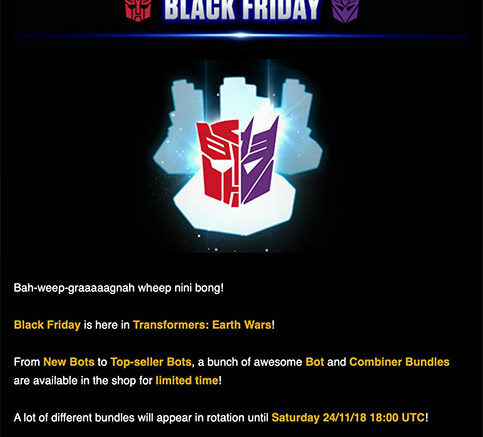 For many players this will be a great chance to get that final bot for a combiner or add a higher star bot. 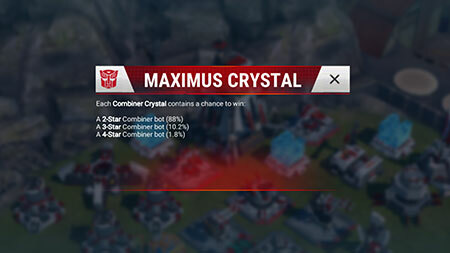 But let’s be real, when odds sit at 1.8% to get a 4-star bot on the Maximus Crystal and buyers only get 10 Maximus Crystals for $19.99, the company makes it really easy to decide not to buy. Thus, a 4-star bot pull, which could be a duplicate by the way, would likely cost you $80-100 just to have the honor of them spending (potentially) months leveling it up. So my questions for Space Ape remain – where are the deals? Where are the incentives to buy with terrible odds on the same recycled package you have thrown at us before? At least dangle a fresh carrot before us if you want your players to truly open their wallets. Be the first to comment on "TFEW: Weekend “Deals” Offer Hard-To-Find Bundles but No Discounts"